The Jonah or Atlantic Dungeness crab is found along the Atlantic Coast from Nova Scotia to North Carolina. Jonah crabs have a stout body and dark brown tipped claws. Jonah crabs are usually caught incidentally in lobster traps. They are sometimes found along shorelines among rocks and in tide pools. 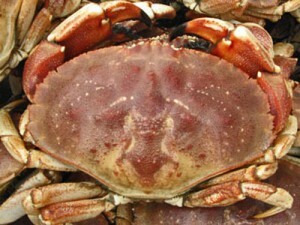 Jonah crab sizes are usually expressed by carapace (upper shell) width. A Jonah crab with a carapace width of 5 inches typically weighs 12-14 oz. ; A 5.5 inch crab might weigh 15-16 oz. ; A 5.75 inch crab could weigh in around 18-19 oz. Jonah crabs are usually cooked by steaming or boiling. After cooking, the meat is removed from the body, legs, and claws.